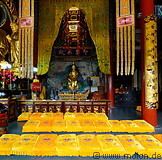 The Tanzhe temple (潭柘寺 or Tán Zhè Sì in Chinese) is an old Buddhist temple located 40km west of Beijing. It is located at the base of a heavily forested hill and extends over a number of levels, with halls and pagodas on each level. The Mahavira hall is the main hall of the temple and is 24m long and 33m wide. The Tanzhe temple dates back to the Jin dinasty and is 1700 years old. It can be easily visited as a daytrip from Beijing.